Was there also savate presentation? Please FISav don't ever make savate anthem like taekwondo and muay thai. Will Krav Maga help at growth of savate? Frenchman Alexis Vastine is denied victory and a place in the men's welterweight semi-finals after narrowly losing to top-seeded Taras Shelestyuk of Ukraine at the ExCel Arena. Vastine, who was also denied a win in the Beijing semi-final four years ago, was furious at the decision, lashed out in rage, then staged a sit in. World champion Shelestyuk then faced Great Britain's Fred Evans in the semi-finals. http://www.bbc.co.uk/sport/0/olympics/19173670 Mark Barriga (Philipines) vs. Birzhan Zhakypov (Azerbaijan) (AIBA wrestling) Japan vs. Azerbaijan Ishanguly Meretnyyazov was expelled after he refereed a match between Azeri boxer Magomed Abdulhamidov and Japan's Satoshi Shimizu. Adbulhamidov was declared the winner of the match, despite being knocked down six times in one round by his opponent. Meretnyyazov was also criticized for giving the Azeri boxer too much time to recover. International amateur boxing rules say that a fight must be stopped after three knock downs in one round. The incident angered spectators and commentators alike, as well as the Japanese boxer who immediately appealed the ruling. The International Boxing Association (AIBA) overturned the initial outcome in favor of Shimizu and expelled Meretnyyazov. On the same day the AIBA also expelled an Azerbaijani technical official, Aghajan Abiyev for allegedly communicating with his home team, thus breaking his contract with Olympic officials. The double expulsion immediately gave way for renewed speculation that the boxing officials were on the take. In 2011 the British Broadcasting Corp. aired a report about secret payments of millions of dollars from Azerbaijan to the international boxing organization, the World Series Boxing. The BBC reported that the WSB chief claimed the money was paid to guarantee that Azeri boxers would win two gold medals at the London Olympics. AIBA is the international governing body for boxing, which is recognized by the International Olympic Committee. World Series Boxing, a franchised league of professional boxing, is one of the organization's partners. The BBC reported that WSB Chief Operating Office, Ivan Khodabakhsh, had discussed a secret deal to secure funding from Azerbaijan in return for guarantees that Azeri boxers would win gold medals at the Olympics. Vikas Krishan (IND) vs. Errol Spence (USA) The Indian boxing team is set to counter-attack after Vikas Krishan's controversial ouster from the Olympics with the contingent planning to file a protest of its own against the International Boxing Association's decision to overturn his pre-quarterfinal win. In a stunning turn of events, Vikas (69kg) was ousted from the Games here after AIBA overturned the result of the bout he had won, following a review. The 20-year-old had won 13-11 over Errol Spence in a thrilling contest last night but following an appeal by his rival's team management, the AIBA awarded the bout 15-13 to the American citing the fouls committed by the Indian which were not noticed by the referee. London: Olympic judges and referees came under fire on Wednesday with one fighter accusing them of “a fix”, another successfully appealing a loss and even boxing great Lennox Lewis questioning some of their calls. Iran’s Ali Mazaheri cried foul when the heavyweight was disqualified after being warned three times for persistent holding against Cuban Jose Larduet Gomez despite leading by two points going into the second round. “It was a fix. I could have got a bronze easily if it hadn’t been for that,” an irate Mazaheri, who walked out of the ring before the decision was officially announced, told reporters through a translator. The International Amateur Boxing Association (AIBA) responded to Mazaheri’s allegations in an email to Reuters, saying: “The Iranian boxer received three warnings during his bout. 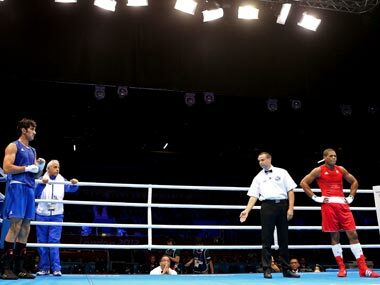 Ali Mazaheri of Iran (L) refuses to stand with the referee for his decision of a victory to Jose Gomez Larduet of Cuba during the Men’s Heavy (91kg) Boxing. Two bouts earlier, Japan’s bantamweight Satoshi Shimizu, trailing by seven points going into the last round against Magomed Abdulhamidov, knocked the Azerbaijani down six times, the first of which he struggled to get up from. The judges scored the round 10-10, handing Shimizu two extra points for a warning against Abdulhamidov, who propped himself up against the top rope as the referee raised his hand in victory. The 25-year-old fighter was helped out of the ring by his trainer and Shimizu’s team appealed the outcome. The Japanese boxer’s team leader Masamori Yamane accused the referee of trying to support Abdulhamidov by attempting to fix his headgear. After deliberating for over an hour, AIBA said that under its rules, the referee should have given the Azerbaijani fighter “at least” three standing counts which would have resulted in the contest being stopped. They, therefore, overturned the result, handing victory to Shimizu, who was staggered by the original decision hours earlier. “I was shocked about the result. He fell down so many times. Why didn’t I win? I don’t understand,” Shimizu told reporters, adding he thought the referee should have stopped the fight with Abdulhamidov obviously groggy in the final round. AIBA officials will consider on Thursday whether to sanction the referee in Shimizu’s bout, the association said in a statement. In December last year, an AIBA-appointed investigation committee dismissed allegations that Azerbaijan was promised two boxing gold medals the London Olympics in exchange for a $10-million loan to the sport’s ruling body. In a statement released at the time, the Special Investigation Committee (SIC) said the report aired on September 23 on the British broadcaster the BBC’s Newsnight programme was “groundless and unsupported by any credible evidence”. Before sitting down to commentate on the session for British radio, former world heavyweight champion Lewis said he was impressed by the talent on show but had concerns about the judging. “What I’m concerned about is probably the judging. You never know who is going to win until the end of the fight,” said Britain’s Lewis, a dual citizen who won gold for Canada in 1988. Mohamed Diaby (MLI) vs Azumah Mohammed (Ghana) - VIDEO is missing AIBA World Boxing Championships competitor Mali's Mohamed Diaby eliminated a welterweight favourite in Casablanca. Diaby made a great run in the second round against AIBA Youth World Championships quarter-finalist Ghanaian Azumah Mohammed and his efforts resulted in one of the biggest surprise of the day. Diaby's next rival will be Gabon's All-Africa Games competitor Yannick Mitoumba Mbemy who eliminated Mauritius' Jonathan Ramchurn. WAKO wish to bring to the attention of all K1 Rules fighters that the WAKO Board have decided to cancel its presentation in the 2013 World Combat Games and to replace it with the Low-Kick style. The reason is that the WAKO Board want to defend the original styles of Kickboxing. In other words, St.Petersburg's Combat Games will show the same styles WAKO had in Beijing in 2010. WAKO is sorry for those of you who dreamed to go to Russia, but WAKO truly believe of preserving the interests of Kickboxing in general. More detailed information will follow soon, but in the next Continental Championships scheduled in Turkey and Romania for Europe, in Madagascar for Africa, in Brasil for the Pan American countries and in Jordan for Asian countries, SEMI CONTACT, FULL CONTACT and LOW-KICK are the styles which will qualify fighters for the 2013 World Combat Games. Comment: Maybe K1 style is for "everyday people" to similar to muay thai ? Is this the main reason?